“One of my goals is to get rid of this law,” Linda Lemaster said, referring to California Penal Code 647(e), or unlawful lodging. After nearly being removed entirely from the state’s law books in recent years, the law was tweaked a bit, but it still remains. It is mostly used as a move-along law for homeless people in San Diego and Santa Monica, according to Lemaster. “I think it was a political trial.” Lemaster said. Linda Lemaster had been a social and political advocate for the homeless and an activist in Santa Cruz County for over 30 years when she was issued a citation for “unlawful lodging” during the Peacecamp demonstrations. Originally held to protest the sleeping ban in the City of Santa Cruz, section 6.36.010 of the municipal code, which makes it illegal to sleep outside during the hours of 11pm and 8:30am in the city, Peacecamp was initiated at the Santa Cruz County Courthouse and Government Center by a group of local homelessness activists on July 4, 2010. Community members gathered at the court house during the evenings and either slept or protested there to make a strong statement against the criminalization of homelessness locally. The action quickly grew and began to included a large number of homeless community members who were looking for a safe place to be at night. Lemaster, the founder of the organization “Housing Now! 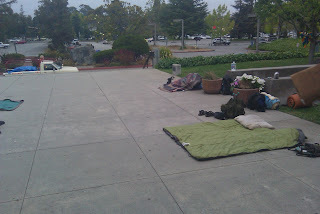 in Santa Cruz”, originally attended Peacecamp to make one on one contact with both homeless people and other advocates. “I use Housing Now! in Santa Cruz as a vessel to stay in touch with how homeless people feel about stuff,” Lemaster said about the group that had non-profit status for its first ten years, and was under welfare’s parent support groups. Now it is mostly just her and whatever volunteers she can find. “Sometimes I’m warning homeless people how to be discreet at night, or this is where the services are. It takes different forms, but because it is ongoing, I think of it as a medium to help me to know when, and how, we can do more,” she said. Eventually, Lemaster became part of a support network at the demonstrations that had her, on the evening of August 9 into the morning of August 10, 2010, attempting to stay up all night to help a sick friend who wouldn’t leave. Over the course of that evening, another friend handed her a blanket, and she wrapped it around herself. 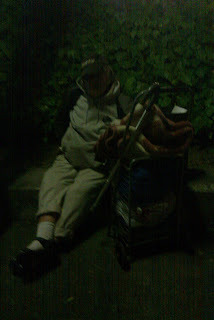 She lay down on the concrete outside of the courthouse, and she may have fallen asleep. When deputies arrived early that morning as part of their enforcement campaign against Peacecamp, Lemaster fit their description of who to target for a lodging citation, which she receive at 4am that morning. Lemaster felt that the process of arriving at the legal definition of lodging to be used in her trial was not fair. “To me it was very frustrating,” she said. She feels that the definition of lodging that deputies were using when they cited people at Peacecamp in 2010 was vastly different from the legal definition arrived at for the purposes of her trial in late 2012. “Four days in a row….the judge changed her mind out of hearing of the jury about what that would mean,” Lemaster recalled. After the trial had begun, the DA even wanted to change the definition again, she recalled. “How can you prepare on either side, for your trial, if everyday it’s a different meaning,” Lemaster wondered. Whether she fell asleep or not on the morning of August 10 at Peacecamp may not have been the primary reason the jury sided against her, according to two members who stayed to discuss their motivations after the verdict was read, Lemaster said. “I tried to talk to him [the sheriff's deputy] when they came around ticketing people, which is what made look like I wasn’t going to leave to some jurors, that I stood while people scrambled, so I wasn’t afraid enough,” Lemaster explained. “If the law is that kind of…soggy, that not moving fast enough makes you lodging and someone else who is scrambling for cover isn’t lodging, there is another good reason that it should be exposed so that ordinary people who have their brains working can get in on this conversation,” she concluded. To Lemaster, the jury also apparently felt that using the lodging law was justified in breaking up a political protest. “The jury foreman said that they all felt that the lodging law would have pertained to anyone once the policeman made his first warning to go, and so they had no choice but to find me guilty,” she said. Lemaster also felt that the judge in her trial treated Peacecamp as a public safety issue, as opposed to a peaceful demonstration. Lemaster sees the possibility of appealing her case as a method of challenging the state’s lodging law, but she says the city and Peacecamp’s original target is still the main issue on her mind. Over the course of the three decades Lemaster has been involved in homeless issues, she has done everything from feeding people through Food Not Bombs, to working for the county in various official capacities to help the homeless. She has participated in a number of demonstrations, and has chaired governmental bodies concerning homelessness and violence against women. She also has first hand experience; she has been homeless herself. One example she recalls of an early success in her endeavors to help those without a fixed address, was when she fought for the rights of homeless people to vote. “Even though it had already been litigated, the county wasn’t letting them register to vote. This was in the very late 70s or maybe 1980 and it took an attorney and I taking them to court, and making us argue all over again that even if they were on a heater grate on the sidewalk, if they were willing to describe where that was, and apply to be a valid voter which you have to do a month before the election, then they are entitled to vote, and it easily won in court once you went to all that trouble,” Lemaster recalled. Lemaster’s advocacy work also lead her to help motivate county officials establish a location where welfare recipients in Watsonville could cash their checks. There was a time when those living in the southern part of Santa Cruz County would have to travel to Santa Cruz to cash their benefits checks. After Lemaster paid a personal visit to county officials, a solution was found within two weeks. The manner in which the authorities dealt with Peacecamp was different, Lemaster noticed. “What I think is most different now, is there is a set of, I don’t know if they are beliefs, policies, or a driving philosophy, but it seems to me that there is homeland security agenda that has changed how government responds to some situations,” she said. Lemaster felt that more governmental agencies should have been involved in the decision making process regarding Peacecamp, but none appeared to take an interest in getting involved. Consequentially, Lemaster felt that law enforcement was left to deal with Peacecamp on their own, and they handled it as a complaint driven process. Lemaster also pointed to Plageman’s testimony during her trial where he stated that he had looked to law enforcement models that were being employed outside of Santa Cruz County when he found the lodging law, as opposed to looking to social workers within the county. “It’s like using a nuclear weapon to whip out Hiroshima, It’s a little overkill,” she cautioned. Beyond the police-centered decision making, Lemaster also compared the way deputies conducted law enforcement activities as being “homeland security” influenced. “At Peacecamp I’m seeing them [sheriff's deputies] on one day, they are comrades, they put their arm around one of the guys when they walk up to him, they check in with everyone, it’s very casual. They seemed to remember people’s names, even if they hadn’t seen them for a few days,” she recalled. When it came to the evening she was issued a citation, however, Lemaster felt their demeanor completely changed. She recalled trying to engage in conversation with deputies a number of times that morning, but they wouldn’t answer her questions, telling her, “We’re a team, we can’t talk to you now,” and, “We really have to do this exactly the same [each time], so bare with us,” she recalled. “Their personal self is still wanting to be comrades, but they have a protocol, and in my opinion, it’s a homeland security protocol,” Lemaster observed. “Indicating it was a military approach,” Lemaster thought. She also felt that this “military” approach, as she put it, was expanded on when the Santa Cruz County Sheriff’s department used similar law enforcement techniques during the period Occupy Santa Cruz spent at the courthouse in 2011, which was during the height of the national occupy movement. “Because Peacecamp had happened, and up to that point they had gotten away with it, they were willing to feel a little more emboldened and capable of the larger group with this homeland security type approach at Occupy Santa Cruz,” she said. An even deeper problem for Lemaster is anti-homeless bigotry, which she feels is “pervasive” and says is also something that had to do with law enforcement’s strategies for dealing with Peacecamp. Peacecamp was reportedly receiving sanitation-related complaints, and Lemaster felt the complaints which were from county employees working in the building, who were coming into first-hand contact with the demonstration, were really about homeless people themselves, and they weren’t fair. “Homeless people come from the same culture that we come from when we are not homeless, but they have to live in a culture that is much more immediate and much more dangerous. “We used to go to the same workshops together…we used to be immediate allies…we used to be part of a team that would confront people,” Lemaster said about some of the county officials who had a say in the decision making process regarding law enforcement strategies at Peacecamp. While Lemaster felt she was once able to visit in person any and every county official she wanted to communicate with, being on trial for lodging forced her to hold her tongue in many situations she once would have openly confronted, because she feared her actions or words could have been used against her in some way during her trial. “I’ve been doing something for 40 years to help poor people, and one part of that is when I find something where the system doesn’t work, I try to show that to people, or even fix it, or help fix it, or find out who can fix it. “Real people suffered because I wasn’t able to be that liaison for them,” Lemaster said. When defending her decision to not plead guilty, or take a plea deal, Lemaster was not only informed by her outlook as a Quaker, which guides her to never lie, but also by a desire to maintain a certain moral high ground in the community as an advocate for others. “Doing the kind of changes that affect people in some practical way in their lives for the better requires a credibility,” she said. “I wouldn’t have minded the infraction’s apparent purpose. But I was being asked to say that I was disturbing the peace on Dec 10th at 4 am or so? I mean, they wanted me to say either guilty or no contest. They were asking me to say an outright lie, expecting me to,” Lemaster recalled. Lemaster plans to continue raising awareness about the laws that outlaw sleep in Santa Cruz. She also plans to file an appeal in her case to fight Judge Connolly’s claims that the lodging law is constitutional, and she wants to make a presentation before the Santa Cruz County Board of Supervisors that outlines “missteps” on the county’s part in relation to how sheriff’s dealt with Peacecamp 2010. Lemaster feels that Santa Cruz is poised to be a leader in finding better solutions to end homelessness. Note: The following is a first hand account of Linda Lemaster’s lodging trial in November of 2012. It primarily focuses on evidence and testimony that was admitted into the court record, as opposed to an analysis of the legal arguments in the trial, though some of the legal wrangling was noted. SANTA CRUZ — An advocate for the homeless convicted last month of illegal lodging won’t serve jail time, a Santa Cruz County judge ruled Thursday. Linda Lemaster could have faced up to six months in County Jail for her conviction of one count of unlawful lodging, a misdemeanor. Judge Rebecca Connolly chose to sentence her to six months on a conditional sentence and ordered her to pay $590 in fines and fees, which she said could be paid through community service hours instead. A conditional sentence is essentially like probation except through the court rather than the county’s probation department. Jurors found Lemaster had violated the law by staying outside the county courthouse on Aug. 10, 2010 along with people participating in the Peace Camp demonstration, which was aimed at protesting the city’s anti-camping ban. At trial, Lemaster testified that she hadn’t been sleeping outside that night and that she had no intention of doing so. She and her attorneys maintained that she stayed at the courthouse that night to look after a demonstrator who was ill. Because of her chronic back problems, she said, she was at least partially lying down when deputies arrived and someone had placed a blanket over her. The tolerance doesn’t extend to situations where the right to demonstrate infringes upon the rights of others, he said, explaining that the three-month long demonstration brought health risks, property damage and limited access to the county offices for the public. It also cost taxpayers for cleanup and security costs, he said. “You don’t get to break the law because you don’t agree with it,” the prosecutor said. Under state law, a person “who lodges in any building, structure, vehicle or place, whether public or private, without the permission of the owner or person entitled to the possession or in control of it,” can be found guilty of a misdemeanor. Byers did not ask for jail time, instead proposing Connolly sentence Lemaster to 40 hours of community service and a three-year conditional sentence. Lemaster told the court she thought her trial had focused too much on the entire Peace Camp 2010 demonstration rather than on her individual actions. She said that while she accepts the consequences of her actions, she believes the ultimate responsibility lies with the government, which has failed to take care of its people and presented the need for such demonstrations. Lemaster’s supporters filled the courtroom for the Thursday afternoon sentencing hearing. “The principles on which this case stood are clearly very important to the community,” defense attorney Jonathan Gettleman said. Gettleman said the idea of community service as a sentence for Lemaster was “ironic” given that his client’s life revolves around providing services to the community and working for society’s most vulnerable. Connolly acknowledged the real issues involved with homelessness, but said that Lemaster’s act of civil disobedience was her choice and it carries consequences. “I do appreciate the efforts made … it served as a vehicle to challenge the consitutionality of the law,” she said. Wild exaggerations about PC2010′s “damaging” activities were irrelevant and prejudicial, but apparently welcomed by Judge Connolly whose many biased decisions allowing prosecution material in after deadline, refusing to allow the defense to add the full context of Linda’s blog, and other errors will be addressed on appeal. Meanwhile it was clear that the smear job the prosecution put on had nothing to do with Linda’s presence there but attempted to confuse the jury with the longer protest (which itself received no littering or vandalism citations, much less prosecutions). The Sentinel writer might have noted that Linda testified under oath that she tried unsuccessfully to get clarity from the deputy who told her to leave whether she could still be there as a protester without “occupying” as presumably is guaranteed by the Constitution (and was allowed for others). This trial was an ex post facto rubberstamping of deputy behavior in getting rid of a political protest without using a legitimate process or finding any real crime. Kind of familiar these days. Showing how capricious and arbitrary the District Attorney’s office has become, in May 2011, a different judge sentenced 2 men convicted of the same “lodging” charge with 400 hours community service. When they refused, the Judge threw them both into jail for 6 months on the spot. “For more extensive information and commentary on this case, go to http://www.indybay.org/newsitems/2012/12/02/18726953.php .” – R. Norse. Despite being shut down over two years ago, the loose threads of Peace Camp 2010 are still dangling in the county court system. After Dec. 6’s sentencing for Linda Lemaster, who received a misdemeanor for illegal lodging at Peace Camp and faces community service plus probation, the longtime homeless advocate and her attorneys have their sights set on an appeal they hope will take them all the way to the U.S. Supreme Court. 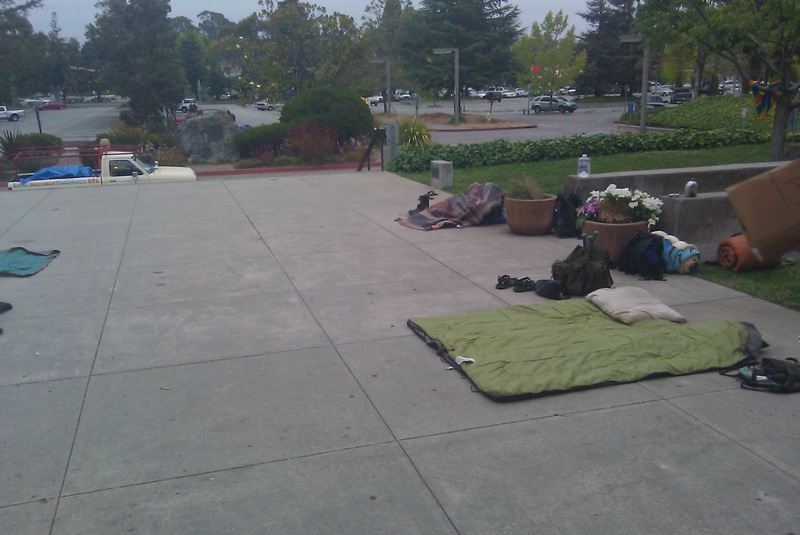 While Peace Camp 2010 was a protest against the camping ban in the city of Santa Cruz, the citations Lemaster and several other protesters received for sleeping on the county courthouse steps were not camping ban violations. They were misdemeanors for violating state Penal Code §647e, which prohibits “illegal lodging”—a citation that falls under the umbrella of “disturbing the peace,” including such acts as public intoxication and prostitution. Assistant District Attorney Alex Byers prosecuted Lemaster and, at the sentencing, made his position clear: “We’re not here because of homeless problems. We’re here because of the rule of law…This is a very tolerant town. But tolerance has limits. Lemaster argues that she rarely spent the night at Peace Camp and, in fact, worked to make the event safer. “What I was doing there was a lot of cleanup and caregiving,” she said. Connolly granted Lemaster a stay on her sentence because Gettleman plans to appeal her case. He says he plans to challenge the constitutionality of §647e altogether and argue that the officers on the scene violated Lemaster’s First Amendment right to free speech. “In the 24 years that Lt. Plageman had been a county sheriff’s officer he had never before used [§647e],” says Gettleman, who worries that if Lemaster loses the appeal it will give county law enforcement free reign to use the law more liberally in the future to break up protests. Local attorney and homeless advocate Ed Frey, who received the same citation as Lemaster at Peace Camp 2010, says he is not hopeful for her in the appeals process. He says he and five other protestors who underwent trial for illegal lodging in 2011 already tried to argue against it on constitutional grounds, to no avail. Local homeless advocates see Lemaster’s situation as representative of what they say is a conspiracy against the local homeless population and the citizens’ rights to freedom of expression. “In Santa Cruz, all of our rights are subject to time, place and manner restrictions,” she said. Santa Cruz Sentinel: 12/06/2012SANTA CRUZ — An advocate for the homeless convicted last month of illegal lodging won’t serve jail time, a Santa Cruz County judge ruled Thursday. “I do appreciate the efforts made … it served as a vehicle to challenge the constitutionality of the law,” she said. Gettleman said he plans to appeal the conviction. Hey Becky, here’s the politically incorrect reality you’re overlooking…. Linda is on trial for PC 647 ( e ) or illegal “lodging” under a little-used portion of the State code, which sheriff’s had not used before citing protestors at Peace Camp 2010. ONLY where the govt. tells them they can. ONLY when the govt. tells them they can. Oh, THAT’s a convenient definition of the code! When a sheriff hands you an unsigned piece of paper, then, according to Byers, that person “has been educated”that they no longer have the right to carry a sign, to protest, or to seek redress of government grievances. And if a protester wants to publicly assemble? They must follow “time, place, and manner restrictions” which are not written in the law anywhere. For ADA Alex Byers, camping = lodging except that “camping” is not illegal in that particular location under County Code. While camping is , according to Byers, essentially the same thing, “lodging” rates 6 months in jail and/or a $1000 fine. 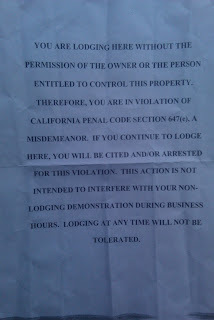 And CAMPING is legal in the location where Linda was cited. Committing the same crime in the City (and Lemaster WAS in the City when she was cited) rates a $92 citation or 8 hours of community service as a possible consequence. So why did the sheriff’s use the statewide “lodging” code rather than the County’s camping code or the City’s Sleeping and Blanket ban? Those at Peace Camp 2010 know better. The plucky little group had discovered that the County’s camping ban does not apply to the grounds around the courthouse and government center. In other words “camping” is legal there. Also, due to jurisdictional agreements, City police do not patrol the grounds at the Government Center. Sheriff’s opted to not enforce City codes against Sleeping and using blankets. Codes that are all infractions, violations of which do not include jail. These were the twin laws the protest had assembled to challenge. Byers told jurors of the flyer sheriff’s passed out willy-nilly to anyone who wanted one: The flyer only stated you are illegally lodging without permission. Merely telling Petitioner or anyone else that they are lodging or that they do not have the owner’s permission in no way clarifies what lodging means or how one can avoid it. In this circumstance “to lodge” illegally appears to have meant to the deputies- to further physically occupy space in any manner on the steps of the Santa Cruz County courthouse. Byers told jurors about a 2-phased Plan to get the protesters to leave the location. –Education phase followed by an Enforcement phase. “Lt. Plageman testified that they weren’t’ interfering with the right to protest. when cited two years ago. “The dictionary includes 14 different definitions of “lodging,” Defense Attorney Jonathon Gettleman quickly added in. Byers showed some really dark and grainy videos which roughly show a mess. John Valley’s voice can be heard and the sound of Linda coughing. Even worse, he paints the protest as characterized as “junk all over”, none of which has ANYTHING to do with Linda Lemaster. Linda was wide awake at 11PM with no bedding. That, at 4:30AM, sheriff’s came and found her sitting up and looking sleepy, doesn’t mean a crime was committed. Byers asserted more claims that I doubt are true. “No one is allowed to lodge on the steps of the courthouse at night.” Huh? Lodging isn’t defined as an activity done at night only. And when Linda Lemaster was there at 4:30AM, she wasn’t trespassing. The courthouse steps were a legal public place to be (at the time. Since this has been changed by County administration to make it a crime to BE THERE between 7PM and 7AM). Linda Lemaster, chair of the former Homeless Issues Task Force and long-time homeless activist, goes to jury trial on Tuesday, November 6th at 8:30 AM (jury selection begins Monday November 5th at 8:30 AM) in Dept. 1 at 701 Ocean St. She is charged with PC 647e, an archaic state “anti-lodging” law for sitting on the steps of the courthouse in August 2010 in solidarity with PeaceCamp2010 homeless protesters, peacefully demonstrating against the City’s homeless Sleeping Ban. Sentinal article – Trial date set in case of Santa Cruz Peace Camp protester – http://www.santacruzsentinel.com/localnews/ci_21024661/trial-date-set-case-santa-cruz-peace-camp – HUFF Blog post of article with comments here. 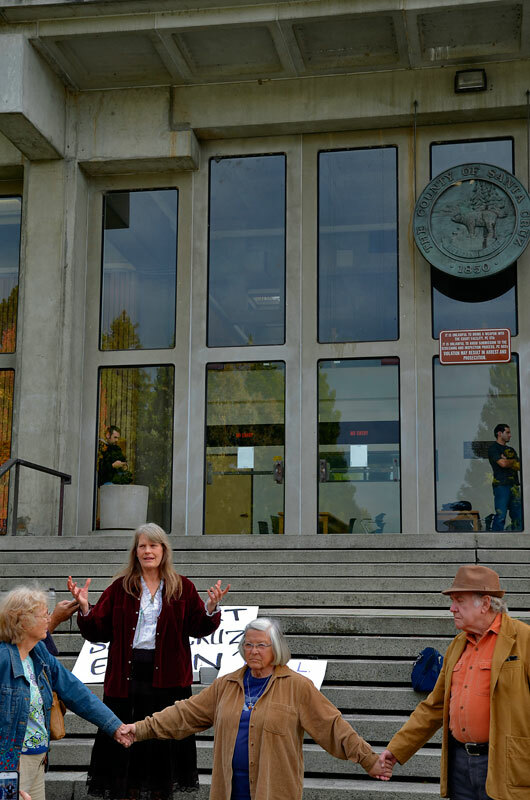 SANTA CRUZ – A trial date of Oct. 15 was set Friday for Linda Ellen Lemaster, a community activist involved in a controversial homeless protest in 2010 on the steps of Santa Cruz County Superior Court and City Hall. 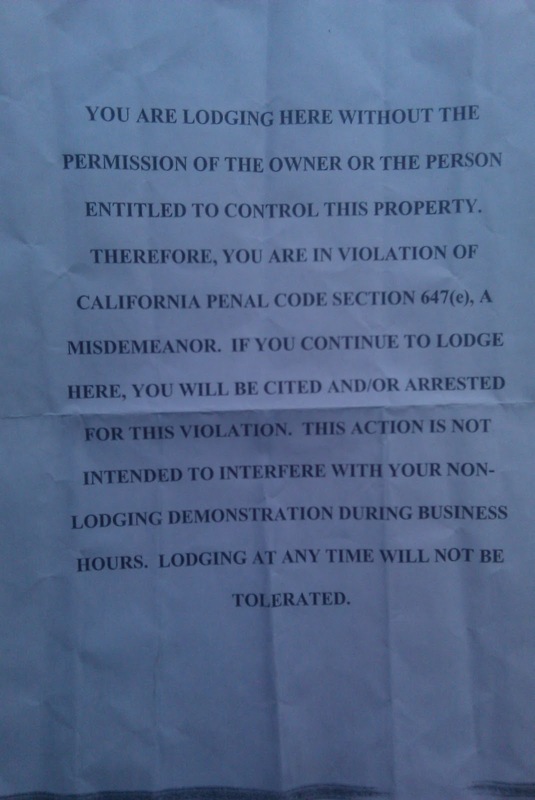 Lemaster, a homeless activist and projects facilitator for the Santa Cruz group Housing Now!, is charged with illegal lodging for her participation in the demonstration. The protest, called “Operation Peace Camp 2010,” gathered activists opposing parts Santa Cruz’s camping ban. The occupation comprised a group of more than 50 people who slept and held signs on the courthouse steps. It lasted three months, before deputies began warning, ticketing and arresting protesters under a criminal misdemeanor law for unlawful lodging. Lemaster appeared in court with friends Friday. Her attorney Jonathan Gettleman said he filed a writ of habeas corpus with the 6th District Court of Appeals in San Jose. The 53-page writ requests the court to hear and dismiss Lemaster’s case, linking it to the protection of freedom of speech under the First Amendment. Gettleman said the illegal lodging law was misused to put an end to the protest and violated the constitutional right of people to assemble peacefully and to petition the government for a redress of grievances. Gettleman said he not only hopes to clear Lemaster, but also to make the illegal lodging law unconstitutional. The federal court should decide whether to hear the case in the next few months, before the beginning of the Santa Cruz trial in October. In a previous case related to the protest, two other activists, Ed Frey and Gary Johnson, were sentenced to six months in County Jail last October. “this law”? If you mean the california pc 647(e), illegal lodging, for which I was cited, youa re mistaken – it does not distinguish between daytime and nighttime. This is one of the many reasons which I believe calls for better accountability by the County (Sheriff’s dept and beyond). because “Lodging” (illegal or otherwiise), as spelled out in California’s laws, does NOT mean “sleeping”. What does it mean? Depends on what “legal authority” one asks. Personally, I may agree that a daytime venue could have worked out better for everyone than a 24/7 demo? Or not: after all we were trying to demonstrate how DIFFERENTLY the displaced homeless population must live, in part due to our dated laws.That demonstration had a time it was daytime only, and a time it was 24/7, reflecting different leadership. But there were problems with each. Problems that warrant selecting out political scapegoats? Or was that an accident? Or just acceptable collatoral damage in our Country’s Reign of Terror against displaced homeless people? Maybe, if we are lucky, the courts can do some actual good, here? Look at you. You’ve already given up your RIGHT to protest between dusk and dawn. Way to surrender your 1st amendment rights which exist 24/7 despite your surrender. Also: you are WRONG. Lodging is enforced 24 hours a day, so they can still arrest you if they continue to use this overbroad and undefined “crime”. 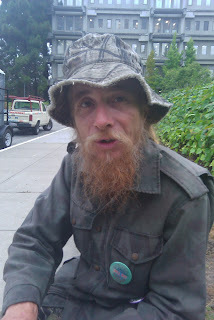 Doug, I did not mug you, arrest you, assault you, get you drunk, leave litter in your path (quite the opposite), vandalize anything you or anyone else brought there — nor did I vandalize the cement or grass, not even a chalk or soot mark by me — and I did not steal during PeaceCamp2010. And I am not a bum. There were a LOT of differing people there throughout PeaceCamp2010. It wasn’t over-run with such as you describe until after the City and County razed the riverbank greenery and displaced fifty MORE homeless people. I agree if you’re saying the demonstration was unpopular, I understand if you’re saying it was an aesthetic disappointment. But I’m not sure that’s your point. I thought “bumfest” was specifically about exploiting homeless folks by getting them to fight and betting on them like roosters, except it’s illegal with roosters? Maybe we just have different meanings for “rich”? I can deal with facing my consequences for this alleged crime, but are you saying I should be responsible for the behavior of other people, of people you, yourself, are NOT responsible for? Yet not a single littering ticket was issued in over 3 months of the protest. I doubt you can say the same about the beach in front of the Boardwalk!